Women's purses are compulsory fashion accessories that have undergone various stylistic transformations throughout history. They have changed in terms of functionality and design. Purses are among the most precious treasures of every woman. The woman's handbag is much more than just a fashion accessory; it represents a status symbol, prestige, and, at the same time, a woman's handbag reveals her personality. Women's purses have always been considered one of the most technologically complex fashion accessories. Most of them are made of more or less luxurious materials (fabric, leather, metal, wood, etc.) that have to be interconnected due to function and aesthetics. Therefore, manufacturers have to know the characteristics of various materials and processing procedures. Slovenia is the third most forested country in Europe, and wood is our natural wealth, our »green gold”. For the love of wood and deep respect for nature, the brand Wooditbe has been created. Wooditbe's wooden purses are unique and completely handcrafted in Slovenia out of the finest natural materials (wood, fine leather, hemp, organic cotton, etc.). They are a fusion of traditional woodworking skills and modern design. All stages of crafting (from sketching to the product coating) are made entirely by hand in our workshop in Maribor, by designer Tomaž Lipovec. However, creating a lady's purse out of wood, which should be sophisticated, elegant, useful, lightweight, and wearable, is not as easy as it is to make it from softer materials. The idea, sketched on paper, needs to be adapted several times through the manufacturing stages. Sewing as a manufacturing process does not work in the woodworking process. It is just screwing, glueing, and sticking. And all those rivets and screws, non-aesthetic metal materials that ensure the hardness of the purse, need to be hidden and made invisible. Which means that the production of wooden handbags is not just a matter of excellent design, but also the skills, arts, and knowledge of wood-based materials and woodworking. In order to ensure lightness and flexibility of bags, we have developed some innovative processes in the manufacture of wooden handbags. 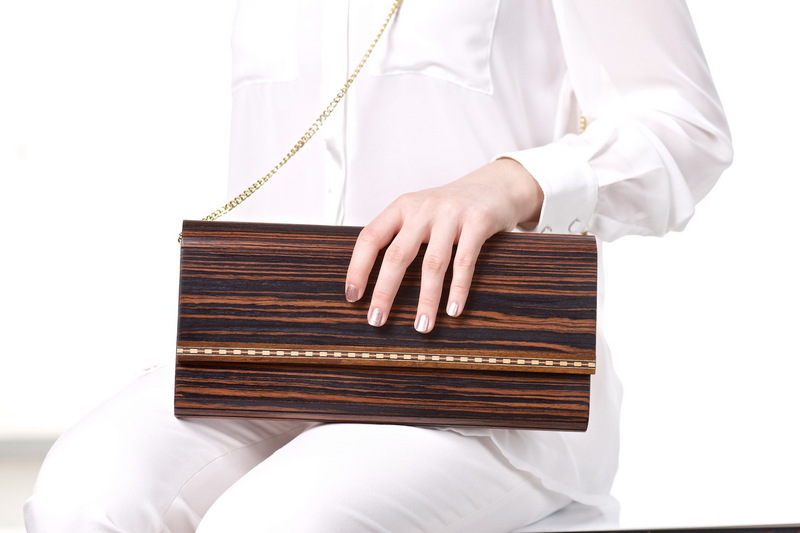 Wooditbe handbags are made of locally-sourced wood, African essences of wood (such us zebrano, rosewood, wenge), and printed décor veneer. Due to the external texture of the wood, each bag is unique. The desired shape of a woman's purse (curves and bands) is achieved by pressing plywood in aluminum models. By using innovative technique of glueing veneer directly on leather with special adhesives and laser cutting, wooden bags have become flexible, light, extremely solid, and durable. A metal kissing lock gives a vintage look, typical of handbags during the early- to mid-20th century. 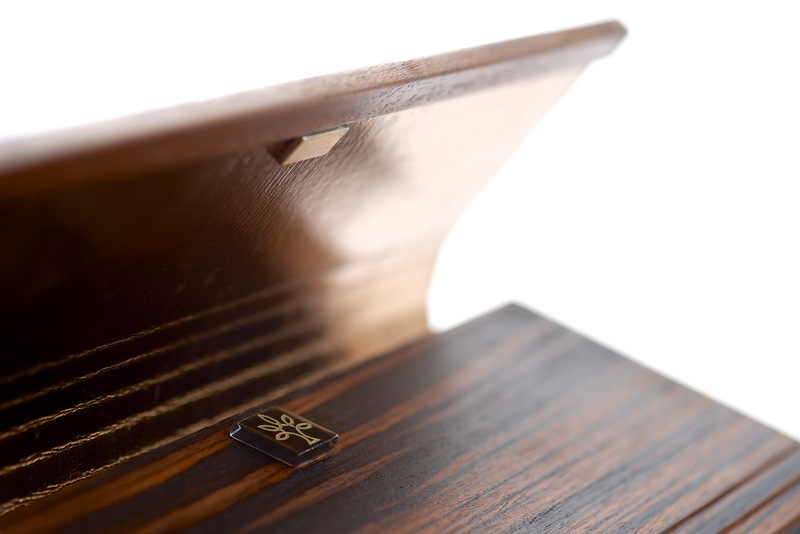 Wooditbe purses are finished with multiple layers of an eco-friendly, non-toxic varnish, which protects products from water and accidental damage and ensures the longevity of the products. Packaging is made of the environment-friendly natural cotton in VDC POLŽ (a public social welfare institution that includes people with mental and physical disorders). We are proud that our purses have been presented at New York Fashion Week 2016 (KIA Style 360) in September 2016, in collaboration with the designer Michael Kuluva. For the outstanding quality and originality of our works, Wooditbe was rewarded among 240 nominated designers from 47 countries and won the title: Merit Award Winner of the ARTS & CRAFTS DESIGN AWARD 2016. Wood is a material of the future, a natural element of design. It emanates a feeling of warmth, a touch of exclusive urban chic and guarantees an everlasting beauty. Wooditbe purses, characterized by excellent design, exceptional quality, and pure perfection of craftsmanship, is certainly a "must-have" fashion accessory for daring and confident women who value unique products, have a sense of aesthetics, and appreciate manual work. During the years of fashion history, thousands of exclusive women's handbags have been created, but only some of them have become legendary, even cult status. They are timeless, always desirable, and take your breath away. We are doing our best to make Wooditbe purses everlasting fashion pieces. We truly believe that such products with distinguished character can awaken people from a consumer mindset of buying a lot of cheap products without soul. And finally, it is a common superstition for people to knock on a piece of wood to bring themselves good fortune or ward off bad luck. It is also why it is so convenient to wear wooden purses from Wooditbe. The designer Tomaž Lipovec is a woodworking engineer, furniture restorer, court expert for applied arts, and the owner of antique shop Antiques Lipovec. Fashion has taken over cultural spaces in Buenos Aires as well as worldwide.